You are being followed by a bunch of mean fish--but you're not going to run away this time. And so you wait for them in an alley, ready to slap, punch, kick and backhand them until they die. You have to defeat a series of fish in combat. These combats are not random, but are puzzles where you have to find out the optimal technique for killing that particular opponent. There is an optimal way of defeating each fish which will give you the greatest number of points. However, you can also defeat the fish in less optimal ways. You will be able to win, but you won't gain the maximum score. Slap That Fish (Peter Nepstad; 30-Sep-2007; TADS 2). Competition Version, Release 1.0 092907. IF Comp 2007: 19th place of 27 entries. XYZZY Awards 2007: Finalist in 3 categories: Best NPCs, Best Individual Puzzle (beating the shark), and Best Use of Medium. Download slapthatfish.gam from the IF Archive. 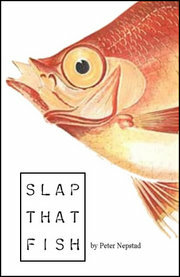 Slap That Fish (Peter Nepstad; 20-Nov-2007; TADS 2). Download slapthatfish.zip from the IF Archive. Slap That Fish (archived) - at Baf's Guide. Slap That Fish - at IFDB. Review (old link) by Dr. Froth. Download walkthru.txt from the IF Archive. This page was last modified on 26 December 2016, at 21:17.